Eliminate dairy products for two months to see if the symptoms resolve. Drink at least eight glasses (two quarts) of filtered water or other healthy liquids a day. Cut back on coffee, caffeinated soft drinks and alcohol – all of which cause the body to lose water. If you suspect that allergies are a cause, consider experimenting with stinging nettles or quercetin to help control your symptoms. Humans are very ingenious. Guys who drink beer and have too much time on their hands can be absurdly ingenious. Collective-E is a great site, filled with entrepreneurial advice for those who are hoping to launch, reinvent or expand a business venture. They are driven by finding and sharing the best in business and PR strategies, as well as the special circumstances of online business strategies. Are you an entrepreneur? Check here: What is an Entrepreneur? Are You One? I subscribe to Angie’s List , a subscription referral service for finding reliable services in your area, like contractors, doctors, dentists, housecleaning services, etc. I think it’s a good idea… helpful when you have no point of reference and need a service. Clean the condenser coils at least annually. Check door seals to ensure they’re airtight: Test your door’s seal to ensure it’s keeping the cold air in by closing the door on a thin sheet of paper. If the paper slips, your fridge is wasting energy and costing you extra money. Dial it down: Recommended temperature settings are 37° to 40°F for the fridge and 5°F for the freezer. Stand-alone freezers should be kept at 0°F. Think Small: Ovens and ranges are appliances and therefore energy hogs. Microwave ovens use about 50 percent of the energy ovens and ranges need, and they don’t heat up your kitchen. Slow cookers can cook a whole meal and cost you only about 17-cents worth of electricity. Don’t Peek: Opening the oven door to check cooking progress can lower the oven temperature by as much as 25 degrees and increase the temperature in your kitchen. Use the oven light instead to check progress. Regularly Defrost manual-defrost refrigerators and freezers. Adjust your thermostat/Keep it Clean: Heating, ventilation and cooling (HVAC) systems are your home’s No. 1 energy hogs. A/C Savings: Each degree you dial your air conditioner above 78°F decreases energy usage and can save the average homeowner about $8 a month per degree. Dial it up when you’re not going to be at home – programmable thermostats make that chore easy. Heating Savings: You can save as much as 10 percent on heating costs by keeping your thermostat set at 65 degrees at least eight hours a day. A programmable thermostat, which can be found for as little as $20, can take care of the dialing for you. Going down to 65 degrees when you’re away or asleep means you won’t even feel the sacrifice. Even More: Check your furnace air filters every time you pay your gas or electricity bill and change them as needed, generally quarterly if you’re using quality filters. The cleaner the filter, the more efficient the HVAC system. A dirty air filter reduces airflow and can create costly obstructions in the unit. Light Show: Lighting is your home’s fourth biggest energy hog. Turning lights off when you’re not in the room really will reduce energy costs – especially if you’re still using incandescent bulbs. The Off Switch: Electronics are No. 5 energy hogs. Video game systems use about the same amount of power when they are in sleep mode as they do when they’re in use. So, after you conquer the Wii, turn the system off and then turn the TV off, too. Pull the Drapes: Direct sunlight can raise room temperature as much as 20 degrees and trigger your A/C. Close the drapes when you’re away so you don’t cool an empty house. Cool it Down: Lower your water heater (Energy hog No. 3) base temperature to 120°F degrees. Your shower will still be steamy, and you’ll save by heating less water. Stand up and Save: Baths generally use more energy than showers because you use less water in the shower, which means you heat less water. A Bright Idea: You need a clear mirror view in the bathroom, but every bulb that lights your way costs money. You won’t notice the visual difference by replacing 100-watt bulbs with 60-watt bulbs, but you’ll see it in energy savings. An Even Brighter Idea: Compact fluorescent light (CFL) bulbs use up to 75 percent less energy and last about 10 times longer than an incandescent bulb. Lose a Quart: Drain a quart of water from your water heater (Energy hog No. 3) tank every three months to remove sediment that slows down heat transfer and lowers the efficiency of your heater. Follow your owner’s manual to accomplish this task because the type of tank determines the procedure. Dry Spell: The dryer is an appliance (Energy hog No. 2), so keep it in top working order by regularly cleaning the lint screen clean and being smart about drying your clothes. Dry thick towels with other towels, for instance, rather than with light tee-shirts that will dry more quickly and use less energy. Don’t forget to clean the outdoor dryer vent, too. Cold Water Wash: The biggest cost of washing clothes comes from the energy required to heat the water. Use cold water for most of your laundry load. Insulate Yourself: Having the right amount – and right type – of insulation will help your home retain the work your HVAC system does year round, but more than half of homes in the U.S. are not properly insulated. Climate determines both type and amount, so determine your needs, or call in a pro to help. Location. Location. Location: Don’t place lamps, TV sets, or other heat producing appliances near your thermostat. The thermostat senses the heat causing the air conditioner (Energy hog No. 1) to run longer than necessary. Be a Little Shady: Air conditioners with proper shading can be more efficient. Air in a shaded space is cooler than the surrounding air meaning the A/C will have an easier time cooling the air. Keep plants, shrubs, and other landscaping about two to four feet away from your outdoor unit to ensure adequate airflow. Buyer’s Market: When buying new air conditioners, refrigerators or replacement windows, buy energy-efficient versions. They’re usually more expensive but federal tax credits and competition is helping bring prices down. You’ll save in the long-term. Check all Corners: An energy auditor, maybe even your local power company, has expert and comprehensive advice on energy efficiency. Safe to drive?? 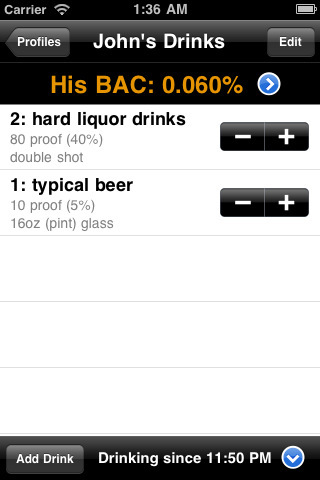 If you or your kids have an iPhone, there are a number of apps that calculate (by estimation) your Blood Alcohol Level… and many will link you to local taxi cab company if needed. Did someone line the bottom of the bird cage with Sunday’s crossword before you got your own chance to make a mess of it? Thinks.com is a site where any day, any time, you can either solve the daily crossword online, or print it out and go analog with a pencil. Click on the puzzle below to solve. iPhones have a nifty little feature where it intuitively guesses the words you are entering, even if you mistype a few letters here and there. This autocorrect feature can lead to some hilarious text messages when “Send” is hit too soon. Where can I get one of those beer tossing ice chests? I know a couple of guys who would love one. Try going to Shootabrew.com…. they are on a “Preorder” status right now!